Back in the good old days, everyone had cast-iron frying pans. During the low fat silliness of the 80’s and 90’s, scientists had to come up with a way to make food not stick in pans so people could cook food with no or virtually no fat. As a result, Teflon frying pans hit the market. However, these pans may not be all they were cracked up to be (sorry, could not resist the pun). Maybe it’s time to go old school again. Old Teflon pans are not that safe and a pain to cook with and must be thrown out. This is expensive for you and bad for the environment. The oil and salt that you cook with as well as the flavours of the food absorb into the pan. This increases the flavor of whatever you cook in it. I know it sounds weird, but I truly notice the difference. They get better with age. Older, more seasoned pans become more and more like non-stick pans. 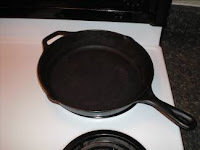 Some people have suggested that you may even get a little extra iron from the use cast iron pans. (I can’t prove this scientifically, but I have heard of cases of this helping people with their iron levels). This can be particularly helpful for ladies – especially athletes. Buying: you can buy new ones in stores that are already seasoned. I’ve done this and it was okay. Used ones are great because they are usually already seasoned. You can get used ones at antique stores (be careful with this – I believe antique is French for “old and over-priced”), however the best prices are usually thrift stores or garage sales. Seasoning: if you do need to season a pan, get something greasy like bacon to cook with the first time. (Note: if you are fitness-minded, don’t eat the bacon – give it to your dog or the neighbour’s dog). You could also rub oil into it. Cleaning: after emptying your cooked food onto your plate, fill the cast iron pan with water and let it soak. If food is quite caked on, put the pan back on the stove (still filled with water) and turn the stove on. Let the pan and the water heat up for 5-10 minutes. This makes cleaning even the most caked on food easy to clean. Pour the water out and scrape the remaining food out with a spatula and then a scrub brush and give the pan a good rinse. DO NOT USE SOAP when cleaning a cast iron pan. Soap pulls oil out of the pan and makes food more prone to stick on the pan. Soap also absorbs into the iron and a soapy taste can get into your food. Dry with a towel or place upside down to air dry. 2016 Update: for a very comprehensive look at cast iron frying pans, check out this article by examine.com.